183 pages in the hardback I won! If you go down to the woods today ... Well, every child knows NOT to, don't they? Tamaya is on a scholarship to the prestigious Woodridge Academy and every day she and seventh-grader Marshall walk to school together. They never go through the woods. And when they arrive at school they stop talking to each other – because Marshall can't be seen to be friends with a little kid like Tamaya. Especially not with Chad around. Chad-the-bully, who makes Marshall's life utterly miserable. But today, hoping to avoid Chad, Marshall and Tamaya decide to go through the woods ... And what is waiting there for them is strange, sinister and entirely unexpected. Be careful. Your next step might be your last. Unusually, I’ve given you two summaries rather than an extract. 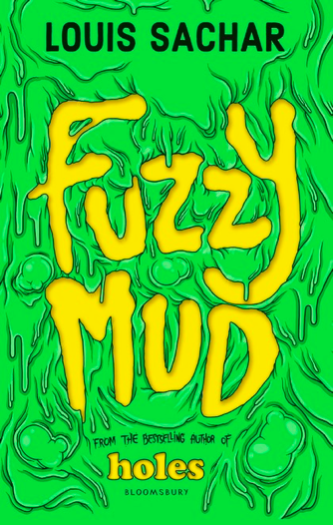 This is because Fuzzy Mud is written in a number of different clever-yet-easily-readable ways – and to pick just one wouldn’t do it justice. Suffice to say, it’s almost a screenplay of a book (in a good way). I would utterly recommend this for almost any reasonably secure young reader – and for older readers too. It has enough interesting plot and ideas, and yet it’s not a difficult read. Super material for debate – be it in the classroom or at home. There are a few scares so the most sensitive souls might not like it, but for most children who like an adventure with credible characters and a satisfying finish, this will please. A fast-paced, intriguing mix of science and American school life. K. M. Lockwood lives by the sea in Sussex - see the pics on Instagram. She fills jars with sea-glass, writes on a very old desk and reads way past her bedtime. Her tiny bed-and-breakfast is stuffed full of books - and even the breakfasts are named after writers. You're always welcome to chat stories with @lockwoodwriter on Twitter.